I hope everyone is having a Happy Holiday Season. I certainly do not mind the rush of the season being over! When you run a creative business, it is always hectic during the holidays! The rush starts in September and does not let up until a few days before Christmas! I am sure that I have a least a pound of glitter in my lungs! Anyone who has one of my ornaments knows I put lots of fine glitter on them, so that they can glisten in the dim tree lights. I usually post a photo of one of my latest creations, however, my latest creations are not quite ready for exposure yet. I thought I would share a photo of our creative baking day. 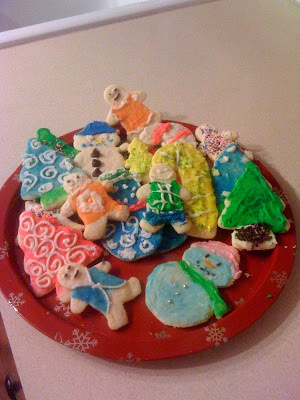 I helped my children make sugar cookies(above). I think they did a great job! It was fun & messy, too! I am sure they will remember the fun we had for years to come! I know everyone is looking forward to a New Year! Hopefully, next year I will not stay absent from my blog. I will try to make it a goal to post at least monthly to update you on the latest in my creative journey. As of right now, I will be attending the Atlanta Gift Show in January. I am so excited about attending. I will be going to check out the Licensing & Design section. I want to see the layout, how things work and to visit with a few designers that I have met along my journey. Hopefully, with the New Year will come some new goals that I will set for myself. Number one on the list is developing collections needed for licensing. Since I am "real new" at licensing, the "developing collections" is something I really have to wrap my head around! It will come, in due time! Well I am off to think something creative! Until next time~Carmen b.